What things are essential in a mustachian kitchen? Re: What things are essential in a mustachian kitchen? Best bang for your buck, looking forward for the rest of your life... probably garage sale or thrift store bought cast iron cookware (enameled or raw/seasoned) from the first half of the 20th century. FI and watching my 'stache grow. * A really cool super-insulated oven that cooks on retained heat and can be had (often) for about $100. 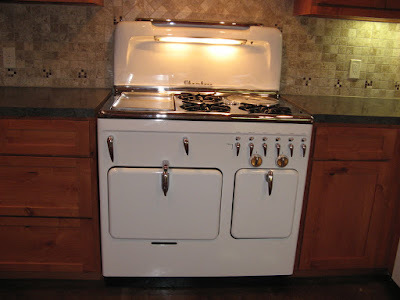 My mom had a stove like that. It worked really well. We left it in the house when we sold it. Wonder if the new owners refurbished it or got rid of it. Interesting - the one fairly Mustachian kitchen item I'm not seeing much mention of is the pressure cooker. It makes it so you can cook thoe time consuming, long stewing/simmering dishes in an hour or less, preventing one from heading for a restaurant when the only thing available is frozen or cheap cuts of meat. Coq-au-vin, stew, pot roast, or dried beans all can be done in an hour or less. Not to mention the reduced energy usage of the short cooking time. And, wonderfully enough, the reviews I've found is that the best sealing one is NOT the expensive KuhnRicon or one of the others, but a stainless steel or Aluminum Presto which sell for around $50. YAY! Look in second hand stores and garage sales for knives and cast iron pans. I have found a number of beautiful kitchen knives that would be $90 new, but only cost $3 to buy and $5 to a buddy to hone, sharpen and generally clean up. I don't think I have to go into how awesome cast iron can be or how a rusted, mistreated skillet can look like new with minimal effort and cost. LOL I was about to mention the good old pressure cooker. I LOVE LOVE LOVE LOVE my pressure cooker. Its the best device on the planet. I paid about $50 for mine too and I can't tell the difference between mine and my friends $200 dollar one. Sport, a couple of my friends have a stove like this! They call her 'Big Shirl' and she is a beaut. For my birthday, a very smart person bought me a 75-year-old cast iron pot. Man, it rocks. If you like to cook large batches in advance and don't mind a slightly bigger investment, I believe you should skip the pressure cooker and get a pressure CANNER. I have this model from Presto (http://www.amazon.com/Presto-01781-23-Quart-Pressure-Canner/), and it works a a pressure canner, a pressure cooker, a very large cooking pot and water canning pot. The advantage of the pressure canner is that you can use it to preserve large amount of cooked meats, stews, soups and other non-acidic meals for a tiny price! When there is a huge sale on meat, you can stock up, cook it all at once and keep it on your shelves at room temperature in handy small (or not so small) jars. The jars themselves can be reused over and over, only the lids need to be changed for about 25 cents a lid. When you need a quick lunch, you can simply grab a jar from your pantry (or your office drawer) to get a fresh soup, stew or chili made with love! As an example, last time we prepared 28 1 cup jars of cooked chicken in one batch that can be used to make sandwiches and salads on the go. Even with a not-so-good special on chicken breasts, the ingredients costs less than two dollar a jar and can make two sandwiches. With it I make salad sauce, mayonnaise, smoothies, ice cream ( mix frozen bananas and heavy cream), I puree soup, blend pie glaze(? ), etc. I use it almost daily, so for me it is considered essential. Got it used for $5 at the thrift store. "As a somewhat mustachian couple (we are working on this) ..... I'm thinking upgrading as in usability and ease of use, not necessarily the looks of the kitchen. " After reading some of the comments criticizing drawer dampers I had to comment. I think the part where you mention that you are 'working' on being mustachian; and upgrading usability and ease of use, has been overlooked. Living the mustachian lifestyle is an ongoing process. We all can't become super hard-core mustachians immediately, living only on found objects and cooking in a pit out back. Jarring noises, a super busy household, lots of visitors, stresses me out. That's just my personality. For me, anything that encourages me to stay in the kitchen and cook is good. I have fantastic Ikea drawers with the soft close and I wouldn't want to go without them. I will sacrifice something else. For instance, to save money I use only baking soda & rice flour to wash my face, and am in the process of "un-dyeing" my hair and letting it go natural. To save money, maybe you can put dampers only on the doors you use most? And you can check out ReStore (Habitat for Humanity) for discounted items. Besides the generic stuff, Oven/Fridge/Pans/etc. Probably the most MMM item is the Electric Pressure Cooker... it' frees up a crazy amount of time. 3hrs to cook something in like 35mins. Time you can spend playing with your kids, helping with their homework, doing home renos, etc. I just bought a $100 slow cooker on sale for $40. It's amazing, already make up some delicious huge paleo cooks. Mm. We did a big Costco shop and I've barely had to buy food since. Eating healthier too. I use the bejesus out of my KitchenAid stand mixer. HOWEVER, DO NOT BUY A NEW ONE. I grew up cooking on my mother's from the early eighties, and she's a very serious baker, and hers is still trucking along at nearly 30 years old, and after thousands of pounds of dough. I was gifted a new Professional Stand Mixer when I married in 2009. It's already wearing out. In 1986, the KitchenAid brand was sold to Whirlpool, and the quality has been downhill every since. You want a KitchenAid by Hobart mixer. Hobart makes commercial mixers, and made all of them prior to 1986, and they are super sturdy. You can get them on Ebay for under $200 easily, and could probably find one under $100 if you were persistent. When my mixer dies in a few years, this is what I'll replace it with. Wow! So glad to learn this. I don't have a KitchenAid yet but I have been wanting one for years... my mom got hers when she got married in 1985 and it's still trucking, which is why I always wanted one, but it looks like that was the end of the line. I'll definitely check Ebay!! He had the amazing idea to use those as a pot rack instead. We spray painted them with that white appliance epoxy stuff and mounted them on some boards that we mounted horizontally to studs, so we have a big metal grid on our kitchen wall instead of a pegboard. We just use S hooks to hang everything. I just think it looks so tidy and awesome, I feel happy every day when I use it... I wish I had a picture to post but I'm at work! Works great for keeping pans stored. Otherwise the lids make it a mess in there! +1 cast iron. Lasts forever, and you reduce water consumption as you don't need to wash it! Also use stored bacon grease for certain cooking as it's free and lasts a long time. Buy a nice set of knives + pots/pans with a lifetime warranty. We bought a high end Calphalon pot and knife set. They both have lifetime warranties. My friends dad has had a set of these knifes for years, and just sends them in the banged up ones every 10 years and gets brand new ones. The pot set came with a big soup pot, so that has made cheap cooking very easy for us. I love my food processor - it enables me to make some of my favorite recipes, including hummus, felafel, veggie burgers, and date bars, and it's also the difference between "too hard" and "no problem" when I come across baking recipes calling for pureed fruit, oat flour, ground nuts, or cold butter cut into teeny pieces (scones, pie crust). Even cheaper. Just clean it with some simple green first and you're good to go. Not "in the kitchen" but for cooking - a good grill. I tore out the "trashcan drawer" - it was just annoying and in the way. I do use the microwave but don't need it. I do own a food-saver and want to use it more for storing frozen or dehydrated stuff. I own a mandoline but am able to do almost as good with my chef's knife. I have cooked over an open fire with a dutch oven and a frying pan. I lived in a home with no appliances - we had a wok, a donated microwave, and a hot-pot. I *can* live with very little. I lived for 2 years in Italy in a small apartment with a tiny kitchen and had very little - but I bought everything fresh daily. Not cheap. What I listed above as regular use are all things that I really do use and help us save money - especially the canner and dehydrator. We eat out rarely, partly because I have what I need to cook great food here. This is a good knife; you don't have to spend $150+ on a forged one. Not sure I can get on board with this. While I've not used this particular knife, I can't imagine it would compare favorably to my Shun that I picked up ~5yrs ago for about $120. While it was FAR more money than I had ever spent on a knife, it's a dream to use sharp. I'm not sure I'd recommend spending that kind of money, but I would recommend a good knife sharpener (something like this). Victorinox actually makes fantastic knives. They'll dull a little quicker than your Shun due to the slightly softer steel, but on the flip side they'll also sharpen easier. Just like everything else in life, the properties of steel lie on a continuum and the knife manufacturer must choose a balance of properties which they think will make a good knife. There's no magic steel that will take a perfect edge in five passes and hold it forever. There's probably a little extra something, whether it be a fancy alloy or a proprietary forging process, added to the Shun, but at that point you're up into law-of-diminishing-returns / tiny-detail-exaggeration-syndrome territory. Sharp is sharp, and the Victorinox can be just as sharp as the Shun if cared for properly. I must admit though that I dropped $120 on the Global G2 linked in the post two above mine. Besides that it will last the rest of my life (though I expect the Victorinox would as well), it also fits me very well (important because I cook a whole bunch and don't like blisters) and is light in the hand (important because I can use the Global in place of a paring knife), so the cost was justified to me. The most essential thing in my kitchen is my knife skills. Not my knife. My knife skills. Knife skills are great because they instantly convert "Man, we should buy an appliance so we can get dinner made faster" to "Yes! I get to chop an onion!" It is immensely pleasurable to dice an onion, or mince garlic, or matchstick cut a carrot. It wasn't always this way. I actually spent some time on YouTube looking at videos on how to use my knife better. Skills are skills because you have to work at them. My chef's knife cost $35 or $40, and I bought it as a separate.It's a Henckels forged something something. I've never found a knife set that made sense; they always came with extra crap I didn't want. I like to ogle the $150 chef's knives but what I have works very well, so there's no reason to upgrade. To maintain my knives, I have a magnetic strip on the wall I stick my chef's knife, paring knife, bread knife, some shears, and a honing steel (I don't have a boning knife, but sometimes I wish I did, skinning a fish is damn near impossible with a chef's knife). I also have a small manual sharpener in a drawer that was $3 on Amazon. I hone whenever I use my knife. I'm not sure how often you're supposed to hone a knife, but I do it every time because it is super fun and manly and I feel like a cartoon villain when I do it. Whenever I hear that sound of my knife going over my honing steel I assume that all women within a square mile are impressed. If the honing isn't cutting it (yuk yuk) I sharpen and then hone. I cook vegetarian at home, so I only sharpen every few months; I imagine someone cutting meat will do it more often. bahahaha, I love everything about this post! I really want a magnetic knife strip. we have an old knife block of my boyfriend's (that is nevertheless full of mismatched knives... hmmm) and we do have a severe lack of counter space in our kitchen so it really annoys me. plus I have this irrational fear that I'm not drying my knives sufficiently after washing and the knife block will somehow become full of mold. I know, that doesn't make any sense since I can clearly see when the knives are dry, but whatever. magnetic strips are just clearly superior in every way. I think I read on here that Williams-Sonoma stores sometimes offer free classes such as knife skills... I looked it up and lo and behold, the one a few miles from our house does in fact do this! I need to get to one of those. YouTube would definitely do the trick (it's how I learned to take apart a chicken) but if I can have someone teach me for free in real life, why not?